If you don't want to be bothered logging in and getting set up with headphones, Microphone etc but would like to view one of the GeneaGala Hangouts today there is a simple way for you to do so. Just point your browser to my Youtube Channel https://www.youtube.com/user/bibliaugrapher/feed and click on the link to the Hangout that would be in progress at whatever time of day it is currently. 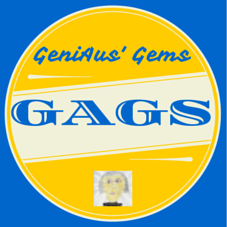 I'm fearful of looking in my GAGs folder on Evernote because I know that I have saved so many posts to consider for this week's GeniAus' Gems post. While Mr GeniAus is watching the football I'll review, select and prepare my post for publishing tomorrow. 1. I learnt about a Welsh resource from Karen Ball in the US. And because I can make it a baker's dozen here's a report on the Genealogy Clinic held at my FHG last week for National Family History Month. In a new experience for me tonight I demonstrated to a group at The Botany Bay Family History Society how Google Hangouts on Air work. I connected with Heather Clarey and members in the Society rooms in Sydney's far south from my kitchen in Sydney's far north. Heather, who worked from her laptop, had set up a big screen so that the members could see us hang out. I had anticipated that we would Hangout on Air but, so that we speak candidly, I didn't press the record button and we stayed in The Green Room. We did not go "Live On Air" and have the session recorded to Youtube as it was better for the newbies that we kept our conversation private. Apologies to those in the GeniAus community who were prepared to join in and say G'day to Botany Bay. I really enjoyed the experience. Heather moved the camera around a bit so I could see the audience and some brave souls commented and asked a question. It was probably good that my image was grainy on the big screen. 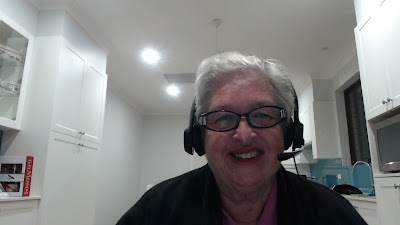 Thanks to Heather and The Botany Bay Family History Society for giving me an opportunity to pay a virtual visit to their rooms to chat about Hangouts on Air. 'Twas a great learning experience for me too. One of the last geneatasks I carried out before my holiday was The Big Spit in which I provided a sample of saliva for DNA analysis by AncestryDNA. As I was having so much fun on my travels I didn't think much about this until I was heading home. Conveniently two months later while waiting in the airport lounge in Bangkok I received notification that my results were in. I didn't look straight away but sat on the results until I got home. So what did I find? On my DNA page that was clearly set out I found a summary of my ethnicity estimate and links to my DNA matches. I was pleased to find that there were some matches. With the AncestryDNA service being very new in Australia I thought that I might not find anyone close to me. I firstly selected the link to look at my Full Ethnicity Estimate. There were no great surprises there. As all my Dad's side hails from Ireland and Mum has a couple I expected this to be over 50%. The Scandanavian bit was at first a surprise as I have no known ancestry from that region but I guess I can put that down to marauding Vikings who invaded the British Isles (my convict roots?) centuries ago. I have D'arcy in my ancestry so that might account for the Iberian Peninsula percentage. I was not able to confirm any Australian aboriginal ancestry as I have learnt that Ancestry does not test for this yet. It was then time to search for cousins. The results told me that 10 4th cousins or closer plus some more distant ones had been identified. I have been a bit sceptical about all this DNA stuff - how could a bit of spit contain so much information? I haven't the foggiest idea but the results I received confirmed some of the research I have done over the past 25 years. 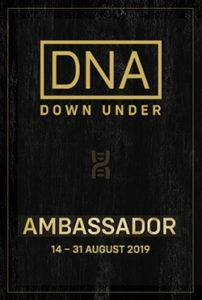 I am so fortunate that two distant Australian cousins in my tree have undertaken AncestryDNA tests and that their results match mine closely - one as a 3rd cousin and one as a 4th cousin. How's that? Now I'm a believer. That's only two from my list of matches but I now have faith that these others must be related waaaaay back. My closest match is a 3rd cousin named Michelle with whom I was in contact yonks ago. I had lost her details but have now reestablished communication and she is as excited as me. In a message she said "It is so exciting! I don't know a lot about this line so would love to collaborate with you." We are related through my ancestors James Pusell and Maria Tucker. I have been able to trace the Tucker line back to Datchet, Bucks but in spite of visits to Wigan and their archives and years of searching cannot identify James Pusell with confidence. Hopefully DNA will lead me to an answer. The image below from AncestryDNA shows how I am related to Michelle. For reasons of privacy I have only shared three generations from the image. Although I immediately contacted the other confirmed cousin (with whom I have no previous contact) he has not yet responded. He is a descendant of my ancestor Elizabeth Phipps. Although he does not have Elizabeth Phipps listed in his online tree it was easy for me to work this out from my research and the names he had published. If one wants to find matches it is vital to link one's DNA results to a tree and to make it public so that others can find you. I have gone through all of the matches identified by AncestryDNA and cannot work out where we have a connection. Of course some of the matches have not made their info private or shared a tree so I will get round to messaging them individually. Today AncestryDNA added a new Shared Matches tool that interrogates one's matches trees for shared matches. It showed Michelle as a shared match but not the other cousin (because he doesn't have Elizabeth phipps in his online tree). As one who has an unscientific brain I find the way the AncestryDNA platform easier to use than the other DNA testing company with which I have tested. I am trying to decide whom in my family I will get to test next. Perhaps someone on my Dad's side. The two confirmed matches I have so far are from Mum's side so a test from my paternal line will help me organise my matches. Now I am going to sit back and hope some of my genimates and unknown cousins take a test with AncestryDNA so that their database can grow and provide more surprises. On Monday morning I was feeling very, very nervous about the GeneaGala series of Hangouts I am hosting on Sunday for National Family History Month. Now I am just very nervous! Thank you to my Genimates who have rallied behind me and have been spreading the word about the Hangouts. I was overjoyed when Hangout guru DearMYRTLE from Salt Lake City publicised the events on her blog and committed to chatting with me online. I'm not going to name my Aussie mates who have shared their enthusiasm for the event online lest I leave someone out, just let it be said that I appreciate your support. A a spreadsheet junkie I have prepared a runsheet/timetable for the event. While many folk have indicated that they will or may join the Hangouts I am hoping that they will commit to being online during a particular timeslot to talk about themselves, get on thier soapbox about a geneatopic or share details of a favourite resource. Into my spreadsheet I have been entering names and topics for discussion throughout the day. So far Pauleen Cass, Alex Daw, Les Tobin, Brenda Wheeler, Jenny Joyce, Heather Clarey, Mary Roddy, Jennie Fairs and Hilary Gadsby have put their hands up to talk (at a particular timeslot) on topics ranging from WW1 to Beginning US Research to Blogging Family History to UK Gazettes. Please don't be shy. If there is a topic you would like to discuss then please contact me by email jillballau@gmail.com and we will negotiate a time to focus on your topic. If all else fails I will just pluck some topics out of the air and hope there is someone online to chat with me. I would prefer to be organised! The hangouts will be available for all to watch live or later via my Youtube channel or live on Google+ but places on the live panel will not be available to the general public. I will only issue invitations to join the online live discussion to those who have responded via the links below that they will or may join me online. This will enable me to restrict the hangouts to those in the geneacommunity. I will follow chat comments made during the Hangouts from within the GeniAus Community on Google+ .If you wish to have your comments monitored you will need to be a member of the community so please apply to join up now. Three years ago I wrote about a new hashtag and blogging prompt for geneabloggers and Troveites downunder. As turning three is an auspicious anniversary I am republishing that post from 2012. Is there a future for #TroveTuesday? Yesterday on Twitter I sparked some discussion about the #Trove Tuesday hashtag which was quite timely as it is three years this week since Australian geneabloggers started writing about Trove and highlighting one or some of its resources in a blog post. They would then post links to these articles to various social media with the hashtag #trovetuesday. This tag has been taken up by various other Australian agencies when praising Trove. I have noticed over the three years that I personally and as a blogger for two societies have been publishing #trovetuesday posts that the number of posts has dropped to a trickle. Yesterday (I had the day wrong) I published a post for my family history group which drew this response from David. I did a search and discovered that our hashtag (the geneacommunity got it first) has been used by a market and bakery in the UK. After I posted a cheeky reply several other Australians chimed in with thoughts about the use of various hashtags for posts about Trove. The subject of our discussion also weighed in with an opinion. I say we take the beach umbrella approach where there is room for all (including a lottery in the US) and keep #trove tuesday alive. I will be continuing to post using the #trovetuesday hashtag (and that is not influenced my the fact that I have several posts scheduled on my blogs into 2016). As Carmel suggests we can use #troveAu when posting on another day. 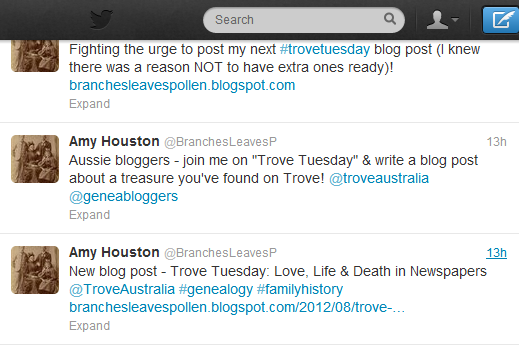 Geneabloggers I'd love to see the #trovetuesday hashtag being dominated by posts about our nation's treasure, Trove, once more. How about embracing it once more. After hearing Michelle Nichols talk at Hornsby Shire Family History Group last Wednesday and pondering on the value of photos to family historians Mr GeniAus thought it would be nice to offer some of his collection to his old primary school. So last week he phoned Stanmore Public School and asked if they had an archivist. They didn't. Then he asked if there was anyone who looked after the school history and if there was anyone who would be interested in copies of his photos from the 1950s. I listened as he asked a series of questions of the person at the other end of the line and got the feeling there was no interest. I was right. When he got off the 'phone I could just tell how disappointed Mr GeniAus was. Perhaps the person he spoke with may have been very busy or having a bad day but surely she could have taken his name and number and asked the principal, the teaacher librarian or folk in the staff room if anyone was interested. We had a little chat and talked about other places that might show more interest. Mr GeniAus phoned the Marrickville Library and asked to speak to the local studies librarian. What a different response he got. The librarian was definitely interested in the photos and would be delighted to have copies in the local history collection. Digital copies will be on their way to Marrickville real soon and should find their way into the online collection there. Kudos to Public Libraries and Librarians. On my recent holiday I had every intention of keeping up my GeniAus Gems posts duirng our time away. New and exciting parts of the world just got in my way. I managed to read many Australian blog posts but I had to ignore those from overseas and as for commenting on posts Pfft!. It's comfortable back in my geneacave and I keep wondering if I really had that big adventure, thankfully we have several thousand happy snaps to remind us of the people and places we have encontered. I thought that more people would be blogging about National Family History Month but reports on the event seem to thin on the ground. 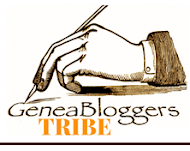 I am enjoying reconnecting with my genimates via their blogs. 5. A reminder form Carmel about some useful videos that I had forgotten about. 6.The State Library of NSw shares good news about electoral roll access. Since arriving home from our eight week holiday last week I have been flat chat getting our house back in order, catching up with all our descendants and my one ancestor and organising a few events for National Family History Month. I still have a long list of things to do so, if I haven't responded to your emails please that is on my 'to do" list. I won't take offence if you send me a gentle reminder. I read many of your blog posts while on the hop but apologise for the lack of comments. Thanks for keeping me informed on all the geneanews from Australia. After the weekend I will be chasing up all the folk who have committed to joining me in the Geneagala Hangouts for National Family History Month. 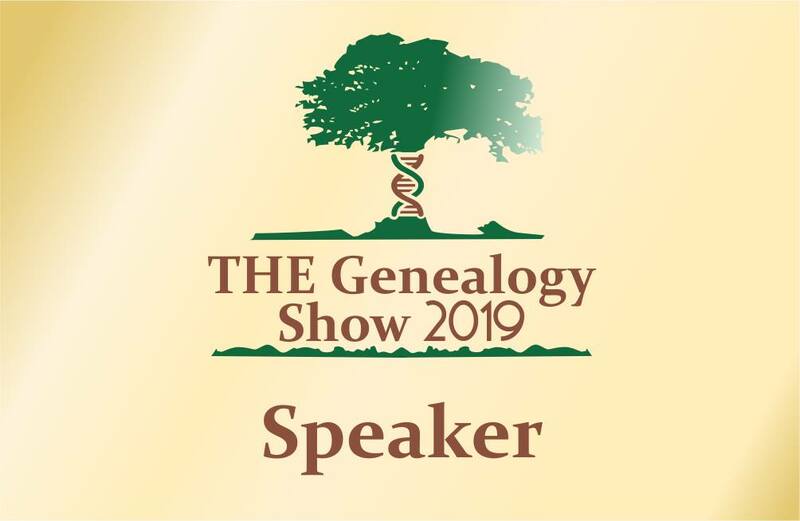 The next task on my agenda is finalising arrangements for our National Family History Month "Genealogy Clinic" and talk on "Beginning Family History" on Saturday. You can read about that here: https://hornsbysfhg.wordpress.com/2015/08/16/genealogy-clinic/. Feel free to pop in during the day. When my elder son phoned this morning he asked if I had scanned a particular photo in our family collection. I told him this was in the "to do" collection and asked why he wanted to know. He responded that he thought it would be appropriate for a blog post today. Any geneaparent would understand how thrilled I was to have an offspring call with a blogging suggestion. Said son knew I was preparing for a weekend away and suggested that if I could find the photo I could scan it and write a blog post on my phone while travelling to my destination so that is what I am doing. Today, 15th August is the 70th anniversary of what we in Australia call VP or Victory in the Pacific Day. In August 1945 my mother was a 22 year old telephoniste who with her sister worked at Sydney's General Post Office in Martin Place. She recalls that when the end of the war was announced most people left their workplaces and joined an impromptu party in Martin Place. The photo my son enquired about features my mother and others celebrating and dancing in Martin Place. Mum is the young lady on the right in the classy two tone shoes. I don't have a source but know it was published in a Sydney newspaper or magazine at the time.. Thank you, Jonathon for your blogging suggestion. I am thrilled that you and your siblings appreciate our family stories. I am thrilled to announce that I have been invited to be an Ambassador for Rootstech in 2016. Since the first Rootstech in 2011 I have been the southern hemisphere's only official voice for Rootstech. Having this role has opened so many doors for me and given me the opportunity to make some lifelong friendships with fellow genies. Thank you to Paul Nauta and his team at Familysearch for once more affording me this opportunity. 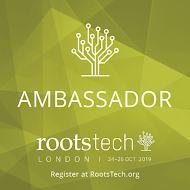 I am so excited that my genimate and fellow member of Hornsby Shire Family History Group, Sharn White, has also been appointed as an Ambassador for Rootstech in 2016. Sharn is one of Australia's foremost geneabloggers. Sharn was one of a contingent of Aussies at Rootstech 2015 and like myself was bitten by the Rootstech bug. Having a fellow Australian as an Ambassador will be so much fun. 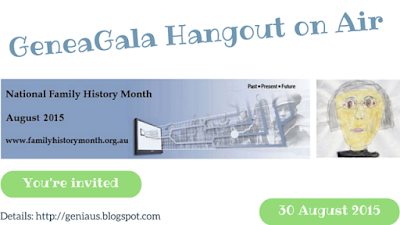 My genimate DearMYRTLE asked me for the local time in another city eg New York of the sessions for the hangouts I am hosting on 30th August (Sydney Time) for National Family History Month. The hangouts will not start right on the hour as advertised on Google+ except for Session 1- I will aim to start the 3 later ones by five minutes past the hour (technology willing). I couldn't let this auspicious day go by without talking about our family's connections with pachyderms. As we have no elephant tamers in our family line I took a look in our family album to see if I had any photos of our elephant encounters. As a young shild I visited Taronga Zoo on many occasions and always enjoyed an elephant ride, I couldn't find any photos of myself atop an elephant but thankfully Trove came up trumps with a photo of a bunch of children on an elephant named Jill - I wonder if I ever rode on Jill!! The next tiime I had an opportunity to ride on an elephant was at an elephant refuge in Thailand in 2004. I thought I had blogged about this local resource from Hornsby previously but I can't find such a post. I apologise if I have previously written about this local resource but it is a valuable one that is worth promoting. The people at Hornsby Library took the decision to publish biographical infomation about the people on the war memorials in the shire in an oline format. I applaud this decision because, unlike a printed work, an online publication is dynamic. As new information about the boys becomes available the site will be updated to reflect this. Prior to my last visit to Canberra in March I consulted the National Archives of Australia catalogue to see what files I could find for some of my indirect ancestors. One never knows what hints and information about one's direct ancestors are hidden in these files. Unfortunately only few of the files I found were available to order in. Most had not yet been examined (to make sure they do not contain classified information?) so I made several applications for the files to be examined and made available for access. Over the course of the last week I have received several emails from The Archives that start "Thank you for your application for access to an item held by the National Archives of Australia. The following item has now been examined". The messages continue with "If you wish to purchase a copy of this item, select the 'Item barcode' link above and then select the 'Request copy' link on the item details screen. Alternatively, please see How to purchase copies. You may choose instead to view the item in the reading room where it is located. If so, please contact the National Reference Service at ref@naa.gov.au beforehand and quote the item details above so that the necessary preparations can be made." As I only live a few hours drive from Canberra I prefer to view and copy the documents myself than to have a copy made and sent to me. Seeing the original document is more satisfying than receiving a copy. My next issue is that I must convince Mr GeniAus that we need to take a trip to Canbera soon. From time to time I like to republish some of my old posts. I have witnessed the behaviour I first wrote about here at local, national and international events over the past year. When I was teaching we drummed into our students the meanings of and differences between Questions, Comments, andAnecdotes or Stories. When we were giving a lesson and students interrupted with a question or comment we would respond to them immediately or say we would deal with it at an appropriate time during the lesson; if they launched into a long-winded anecdote that had little to do with the topic under discussion we cut them off with a "sounds like an interesting story, perhaps you can tell us about it later."